Dallas, TX, October 04, 2018 — ProPath is pleased to announce that they have been selected as the pathology service provider for Baylor Scott & White Medical Center – Sunnyvale. In addition, ProPath’s Dr. Isabel Hill has been named Medical Director of Pathology Services. This is the second Baylor Scott & White facility, and the 26th hospital overall to incorporate ProPath pathologists in a position of leadership within their organization. 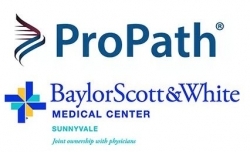 The pathology agreement between ProPath and Baylor Scott & White Medical Center – Sunnyvale went into effect on August 1, 2018. ProPath is the premier provider of pathology services to clinicians and medical facilities nationwide. As a physician-owned organization founded in 1966, ProPath is devoted to comprehensive, high-quality anatomic and clinical laboratory testing for unparalleled patient care. ProPath’s team of nearly 50 board-certified physicians offers subspecialty-expertise and training in 20 different areas including breast pathology, cytopathology, dermatopathology, gastrointestinal pathology, hematopathology, immunohistochemistry, molecular pathology, podiatric pathology, renal pathology, surgical pathology and urologic pathology. Advanced technologies and highly trained staff allow for accuracy, timeliness and efficiency. For more information about ProPath, please visit www.propath.com. You can also follow us on Facebook, Twitter, Instagram and LinkedIn.